July, and just when we are at the height of summer, I bring some bad news for keen satellite-spotters out there. 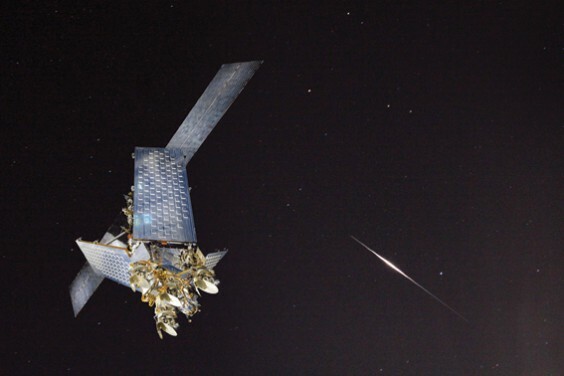 The wonderful Iridium satellites are being replaced with more modern ones and we will lose one of the most amazing spectacles in the evening sky. OK, let’s start at the beginning. The very short nights of midsummer don’t allow for much in the way of stargazing but it’s the perfect time for observing some of the thousands of man-made objects that orbit our planet. You just need to wait until the sky starts to get fairly dark, get yourselves seated comfortably, perhaps with a few friends and something to keep the cold out and stare skywards. As your eyes adjust, you’ll soon spot the occasional bright dot crossing the sky, at about the speed of a passing aircraft but without any flashing lights. These are satellites or, more commonly, the spent rockets used to launch them. These tend to tumble, as they are uncontrolled, and so vary in brightness. You can even find out exactly what they are by checking on http://www.heavens-above.com but don’t spoil it by spending more time looking down than up! One thing the website is good for is to find out when the ISS is visible. This can be done in advance and is well worth it as the Space Station is astonishing to see. So why the excitement over Iridium? Well, this is a global phone satellite system, used by explorers everywhere to phone home, and the huge aerials needed reflect sunlight very well indeed. This shows up as an extremely bright flash of light in the sky, seemingly from nowhere. These flashes are also predicted and are well worth looking for but you need to know exactly where to look. Fortunately this, too, is shown on the website by clicking on the date. The replacement satellites don’t use these aerials so won’t produce the same effect – so get Iridium-spotting now while you still can. One of the best ways to locate the position of a flare is to gauge it against a bright planet. We have the two brightest with us all month and they appear as soon as the sky starts to darken. Venus appears in the west in the glow of the setting Sun and is very obvious. For the first week or so, Mercury is between it and the Sun but will be a challenge to spot, being so close to the horizon. Well worth giving it a go though, especially on the 14th when an extremely slim crescent Moon is close by, itself difficult to see. On the following two nights, the Moon gets a little thicker and is either side of Venus so this presents a better viewing opportunity. Higher towards the south is Jupiter, easier to see because it sets later and is better placed in the sky. An even bigger Moon visits on the 20th. Full Moon is on the 27th and will be very interesting as it will be totally eclipsed as it appears. Look out for it from nine-thirty.